This Sunday, Wes will preach on what he has learned over seven-plus years of serving as a pastor at The Painted Door. This sermon marks his transition out of church eldership and into a season of simply being a fellow church member. Pastor Morgan reflects below on how Wes has influenced him individually and our church collectively. In 2016, various leaders of The Painted Door gathered at our new church space for a team brainstorm session of sorts. It was led by a very nice fellow who specializes in helping churches and organizations cast vision and find purpose. Initially, there was a collective groan in the room. It reeked of mega-church, corporate babble. But as the hours passed and ideas were collected, vetted, recollected, and filtered, the room softened. Emerging before us were the hopes and dreams of our little family -- the gifts and callings of these saints God had brought together. And then there was Wes. Wes was teased a lot that day, because he kept saying one thing over and over in response to every question: “Leaders leading leaders. The cultivation of wisdom.” Many of us took turns imitating him, doing our best to mockingly emulate his deep, radio voice. Yet, two years later, I can say that nothing has influenced my time as a pastor more than that little refrain from Wes. In it, I heard Christ and I still hear Christ calling our church to love its leaders and equip the saints for the work of the ministry. I hope everyone hears Christ in Wes's words. Every Christian is a leader in the kind of leading that matters most, leading others to Christ. And every Christian is a servant called to serve one another according to the wisdom each one is given. It is hilarious how often Wes turns out to be right in his own quirky way. It happens too often to count. Of course, he's sometimes completely wrong! But in either case, Wes has proven a trusted counselor and friend to me. He is a man of prayer. And he is patient in prayer. He knows that life in the flesh is a life filled with thorns, so seek to move from task to task with contentment. He knows that life in the Spirit is a life in summer's fields. So sit, walk, or run, because Christ is with you, always. When Wes told me he was resigning from his seven years as an elder, my heart sank. But it quickly bounced back, because I know Wes is committed to continuing to be a brother to me and to all of us. Wes, thank you for your service. Church, let's continue to love the Oaks family. And be bold in our love. On Dec. 1 at 6:30pm, we’ll be holding a memorial service at the church in honor of Joshua Martinez. The service will also be a time to remember all the little ones who have passed either before or just after birth. We want to invite everyone to come participate in this important night. We are ramping up our partnership with Reborn Ministries and there are lot of opportunities to serve. You can see specifics on the clipboard on the info wall in the foyer or if you are interested in training people in basic job skills, you can contact Will Little at wclittle@gmail.com. Mark your calendars for Friday, Dec. 14 at 6:30pm because our Youth Cohort will be putting on a Christmas Party that night for the whole church. More details to come. 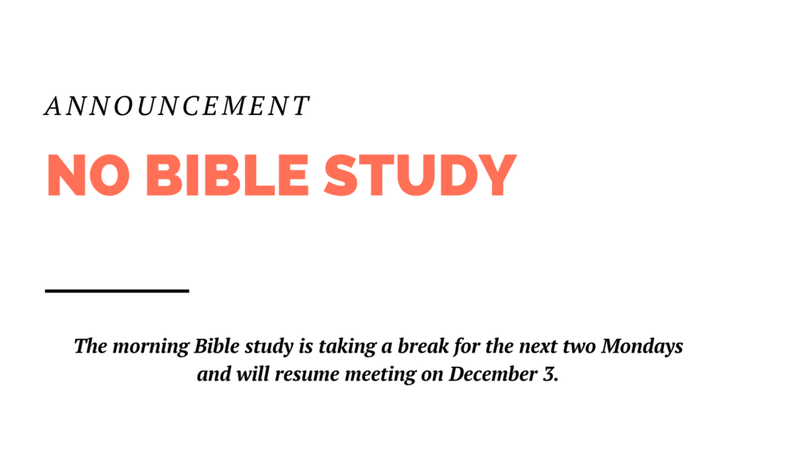 The Monday morning Bible study will be taking a break for the next two weeks and will resume meeting on December 3. Strength. Independence. Perseverance. We aspire to these traits and think of them as signs of a healthy personhood. We love stories of personal triumph over exponential odds. We enjoy our visions of autonomy and independence that promise joy. Yet, who among us have found the fruit of love in our own stories of standing strong? Who here have seen love birthed from staying true to ourselves? Self-love perhaps, but that kind of love hates God, it doesn’t know God, it cannot. The humility and dependence of Christ carried him to us in joy. Brothers and sisters let us take up this mind of Christ, let us live and love, let us cherish wisdom.